The folks over at XDA have done it yet again! The one thing HD2 owners have been patiently waiting for since the day Windows Phone 7 was officially announced, seems to be getting closer to fruition. 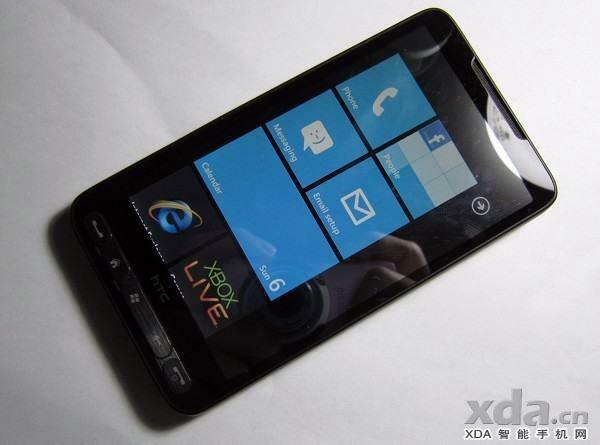 Hackers over at XDA.cn claim to have sucessfully ported Windows Phone 7 over to the HTC HD2. In addition to posting several pictures of the HD2 running Windows Phone 7, they’ve also uploaded videos showcasing functionality. The video demonstrates the HD2 booting up, placing calls,multi-touch, Pictures hub, lock screen, Music hub, Office, Settings and more. We’ve queued up the videos below for your viewing pleasure! Will this effect your HD7 purchasing decision? Let us know in the comments! lol you think only a few people bought the hd2? More like the few who didn’t return it. the few who didn’t return it ? tmobile has sold over 5 million of them…. which are still SOLD NOT RETURNED. Really, A few, maybe the best received windows mobile phone ever? 6.5 definitely. kickstar i appoligize for saying bad things to u fornot publishing wp7 news. If you tether, don’t put Windows 7 on your HD2. They stripped that app out of it. Gotta love the HD2. You can put Froyo 2.2 or Window’s 7 on it. Either way it’s totaly customiziable. Save some serious Christmas cash and get an HD2 then heat to XDA and turly make it your own. Pretty pointless when you wont be able to access the marketplace to download games or applications. Wont get much functionality out of just running the stock OS. but efjay, if you put the HD7 load of Windows 7 OS do you think Microsoft can tell it is not official HD7 phone? Looks great! Hopefully I can enjoy this software on my Dell Venue Pro tomorrow, lol. I’d love to get the HD7 but it doesn’t have: Expandable memory, Flash 10.1 support, No Copy & Paste (Early 2011). All the things I love about my Android. Now if Window’s would incorporate it into their phone then maybe. Like you said mtnman, all the above is coming in early 2011. worth the wait? Wow Windows Phone 7 looks extremely lame! Wow, YOU sound extremely lame! The way you spell your name is extremely lame, 2FR35H..
Forgot to mention that it isn’t an HSPA+ device, nor does it have a FFC. So let’s review shall we? Who’s gonna be first in line? Yup, I won’t need it, I’ve played with it…its a version 1.0 software, how many of you were sold on Android at 1.0? It was missing plenty of features, so let’s not excuse where Android came from either. Well it’s technically version 7 lol. They’ve had plenty of chances before WP7 to get features right. Not to mention WinCE, which WP7 is based on, is also at version 7. So really there should be no excuse for missing features. It’s not version 7 though, it’s an entirely rebuilt OS from the ground up. It’s absolutely nothing like its predecessor. It’s going back to the drawing board and starting over. Technically, it’s NOT version 7. Its version 1. This is a NEW operating system. Instead of waiting another year, before everything was working, they released it now. It is very stable, but only missing features which will come in updates, starting early next year. It makes perfect sense to release it as soon as possible rather than waiting for the competition to get even farther ahead. Nice to see you come around and give it a chance David. BTW wm7 doesn’t exist. This is Windows phone 7 which is an entirely new OS. WP7 bring a new type of UI, which doesn’t only rely on apps on a screen, but presents a new way of displaying information. a fantastic way to make a horrible phone worse…amazing as it sounds.. Okay David you got me there. I do remember all the things I didn’t like about the first Android versions. Android has come a long way. Just seems to me that Window’s know’s all the stuff that has been incorporated into BB, Android and would make a phone that was at least on par with them. But you’re right we’ll just have to wait and see further expansions on the Window’s OS. Perhaps they are waiting to do it better than the “other” guy. Apple waited for 2 years before implementing copy and paste and when it was implemented it was hailed as the best iteration ever. Sometimes to do something right, you don’t have to do it first. I won’t be envious over the hd7 anymore!!! is this offficial yet? can we have link to download the software? It will never be “official.” But, seeing that, he didn’t use the internet probably means that there is no working data yet, which is understandable. Wait a few more weeks, and you may see something more stable. A few more months and MANY of the kinks will be worked out. It doesn’t really work like you think. This is the same as putting android on it. The EVO is arguably very similar to the HD2, Android took a while to be ported to the HD2. This, if stable, is a breakthrough. Anyone able to translate that page enough to find the d/l link for the ROM? Noticeably smaller screen on the HD7. Other than that, I’m sold. If not for owning a vibrant and hoping the Nexus S rumors are true I’d love that phone. I’ve missed mobile Office since I last had an MDA which got replaced by the G1. Nothing replaced being able to create a spreadsheet on excel and drop it on my phone and work on it natively. And google still hasn’t added a native todo list. Loving my Vibrant tho and the Nexus S would hold me over for at least a year pending whatever the next great thing is. The device next to the HD2 is the HTC Surround (AT&T). David I had the hd7 since the 5th. Our store had gotten it in and have been playing with it ever since. i have to say i did not notice the pink tint on the camera. and the screen displays black better than the surround…. but now i am leaning towards the dell. It was only a matter of time considering the hardward specs of the HD2… Amazing job. One thing to keep in mind, is that you have to be more than a little tech savy to get Android up and going on the HD2. I haven’t tried this yet, but I have never been able to get Android up and going on mine. Wish I could. I’ve read all the threads, but I still keep doing something wrong. Yes the HD2 is pretty loose when it comes to customizing, but not all of us can do it. May try this and see if it is any easier for me to use than the Android builds. Curt, find me on XDA under this same screenname,and I’ll give you the info on the ROM/radio, etc that I’m using to get Android working fine on my HD2. Just follow the instructions. Good luck! Until T-mobile releases another 4.3″ Android phone, the HD2 will be my phone. Hell, Android on the sd runs so smoothly as it is I can’t see myself changing for the foreseeable future anyway. G2 may be faster but its not anywhere near as sleek. Mytouch 4G looks like a toy. I wonder if you can remove that crap Xbox live from it? crap xbox live ? wow , you must be an apple fanboy *thumbs down* . The xbox live experience is okay . I really like the integration though . For those of us who actually have a gold subscription and play games it is a neat feature . Not to mention the ability to message users on XBL from your phone. OK! You people did believe me huh,I posted the above new video yesterday in the other thread, it was posted this time for all non believers to see!!!! Oh well, I look forward to grabbing a cheap HD2 and giving this a shot. How do I do this to my HD2?